Konrad S Leader is an accomplished and professional family photographer, who has over a decade of experience capturing a whole range of family celebrations – from the first baby photographs to graduation – let me capture memories that you can cherish for many years to come. The Konrad S Leader Photography studio is located on High Force Road, just off the A66 and A19 which makes it easily accessible for people across the North East – we’re just 15 minutes down the road from Yarm. 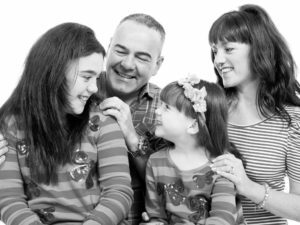 Whether in the studio or out on location, your images will reflect the personality of your family, with high-energy sessions making the sessions enjoyable for all. Whether you want someone to capture your teen’s hobbies, the enthusiasm of your little ones (especially when there are props involved!) or simply the relationship between family members, then look no further than Konrad S Leader. You needn’t worry if you have little ones who are shy around the camera, as I prefer to take relaxed and natural photographs so that no one has to worry about what pose they are holding. Because of this, your family photographs will show how unique your family is rather than how I think you should look. Whilst I strive to take photos that can be displayed on your living room wall for years to come, I also want to capture fun and realistic moments between your family – not perfectly posed ones. Konrad S Leader family photography prices start from £35.00 for studio shoots and on location sessions in Yarm and the surrounding areas. For photoshoots on location that may be further afield, please don’t hesitate to get in touch with me to discuss your requirements further. I am happy to offer a wide variety of digital packages and wall art to show off your unique portrait photographs at their best. Konrad S Leader Photography gift vouchers are now available! They make the perfect gift for any occasion, so make sure to get in touch to buy yours today. Feel free to contact me today to discuss how one of my family photo sessions can provide a unique set of photographs for display or as a gift for loved ones. I’d love to discuss your ideas and provide suggestions to make your family photo day one to remember.